The fire is the temple, the circle, the altar, the axis mundi, the conduit between planes of reality & consciousness. Sacred fire is the heart of the ritual, the dance & the music. Nurture the fire, take responsibility for it. If the fire is alive, the energy will be alive. It is also sacred space, just like any other ritual space. Though there are no defined leaders in most fire circles, it is nevertheless a ceremony. It is a ritual of co-creation, of collaboration and group energy coming together to create a powerful and beautiful magic of celebration. It is everybody’s fire, not somebody else’s. 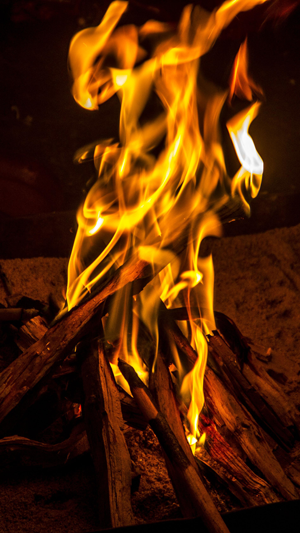 We all co-create the energy that surrounds it and makes the ritual of fire circle happen. It’s wholly participatory, not a spectator sport. No matter what you are doing in the circle, even sitting & listening, you are part of the energy and helping to create it, and your actions influence it. Ask yourself, does what I am doing add to the group cohesiveness, increase our connection and energy, or does it draw away from that, or fragment it? How am I affecting the circle? Use inebriants with care—they are gateways, openers of doorways, but when you move into the experience, you leave the gate behind you. Be conscious of their effects on the whole circle’s energy. Be attuned to inner self and journeys, and also to the music, to the community energy moving around the circle. Trance both inwards & outwards, aware of self & the journey. In the sweet spot at the heart, the fire and the music itself will communicate to everyone. Manifest sacred play. Keep moving! Let the drummers see & feel the fire, keep the energy circling. Keep it lively –if it gets too crowded & stagnant in the center, a dancer moving in and out among the others, or widdershins along the edge, can start it going again, get people to turn around and keep moving. Listen to other drummers & musicians. Seat yourself near them, or stand near other singers while you sing, to keep synchronized. Match your chant to the rhythm, or wait for a pause before starting it, (practice it in your head to see if it fits, or ask someone else if you’re unsure). Share water, fruit, or sweets with the drummers and dancers. Bring water to drummers. Keep the talking, jokes, storytelling, etc, outside the circle. These drain energy away from the center. The music and dance are the center, heart and focus of our activity in fire ritual. Breaks are natural—feed the drummers, share water with drummers, start a song if it goes on too long. If the energy is low, start a song, clap your hands, pick up a drum or rattle, and gently shift it to a higher vibration. Make up a song, invent something. Sing a line, let others improv around it and build with it. 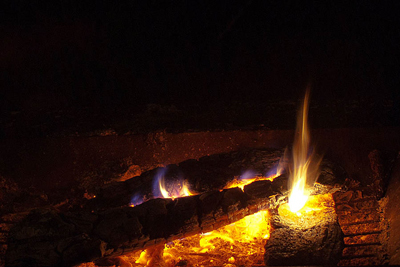 Build up the fire when it gets low, keep enough wood on the fire to see each other’s eyes across the circle. Silence is also a tool for increasing unity. Om to resynchronize, to pull people up from their individual trip and into the collective harmony. This is about group energy, co-creation, communityunity. Keep inebriants moderate. Hands off people’s bodies! Give everybody the freedom to be one with their bodies, the earth, air & fire, the ancestors, the timelessness of the dance. Freedom from sexual objectification is part of what makes a circle safe. Safety and trust are intrinsically linked; remember that we are in a place of perfect love and perfect trust.